← 1500 = Fifteen Hundred or One Thousand Five Hundred? Reality shows (shows about real people or real events) have become very popular in the U.S. and worldwide. There are competition shows, shows that follow celebrities around in their daily life, and many others. Even for those of us who watch reality shows, it seems that TV producers (makers of programs) are getting more and more desperate (wanting something very, very much and willing to do anything for it) and outrageous (shockingly bad) with show ideas. Then again, maybe I’m just old-fashioned and these shows aren’t over the top (gone too far). Here are a few reality shows that are considered to be among the very worst ever on American television. Which do you think is the worst? Are there others–past or present–that you think are worse than these? A young woman who gave up a child for adoption (for someone else to legally raise as their own child) tries to pick the long-lost (has not seen for a long time) biological (by blood) father of that child. She has to pick from a group that includes several impostors (a person who pretends to be something he/she is not). If she guesses correctly, she wins $100,000. A very wealthy rancher (person who owns a large farm) and land developer (builder) puts his large ranch estate (house, land, and valuables) up for grabs (as a prize). His friends and members of his family competed. The winner was put in the man’s will (a document that tells others what you want to do with your belongings after you die) and will get the estate when he dies. Four unmarried couples travel to an island. They are given many temptations (desire to do something wrong) to lure them (try to get someone to do something) from their relationships. Each person spends time alone with members of the other couples in tempting situations, such as being in a hot tub (a small pool with hot water and bubbles) or in a bedroom together. Armed and Famous puts famous celebrities on the streets as cops (police officers) in a small town in Indiana, in the Midwestern part of the U.S. The celebrities are trained to be police officers. They then go along with their training officers to patrol (watch over) the streets. You see how the celebrities handle their training and how they operate as police officers. I’m not very keen on TV shows. I don’t really like none of them, although I can understand and respect the fact that other people might like them in spite of it’s not my case. They are becoming more and more exagerated and I believe they don’t teach people how to upgrade themselves but the opposite. That’s why I don’t enjoy watching them and I prefer using my leisure time practising sports, reading, watching movies or even broosing on the internet. None of them are Good. There are no such TV Shows in South East Asian Countries.But I am a little bit worry that they would be convert into South East Asian Countries. I do think the same that Julio thinks and do in the same way he did up to my age, so to me all are incredible bad and don’t like any of them or none reality show that ever may emit on the TV., here or out of Spain. The worst?…..pinto pinto gorgorito……..The will. But all are more or less the same “in my opinion”: rubbish. I’m sorry if somebody may be feel offended by my comment but it is what I feel about all these kind of things that play with human sensibility, ambition or necessities. If we look inside human heart we all know that some of us feel better when we see other persons doing ridiculous, being not loyal, or doing silly things to earn money. But I am going to vote despite all what I said, ….too much as ever. As a consequence, the reality show producers are now very careful. 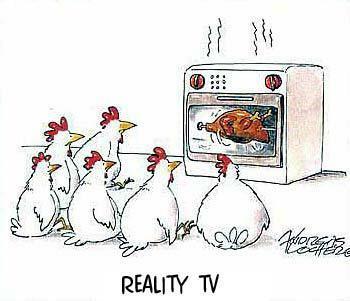 Let’s call things with their names “reality shows” are crap!. And it’s also wrong calling them “reality”, because when you have a camera behind your back, you cannot be yourself as you are when you are alone. Anyway, i do not own a tv, so maybe i am not the right person to ask about television. I have been listening to the radio for many years. I think that “Who’s Your Daddy?” is the most worst, actualy I’m surprise to know that exist this kind of show! Here in Brazil we have The Big Brother, wich is curently in 9 or 10 edition, just to have an idea how this program makes sucess here, nowadays Big Bhoter is the show that bring more profit and attracted a large number of advertisement. I would like to say thank you for all ESL team to bring some interisting topics not only to improve our english but also to think about how we spend our free time, watching or not TV. I do believe that is important to reflect the power of TV and choosing what kind of show you’ll watch. I have never watched the above shows. However, I have watched the The Bachelor and I hated it becuase it didn’t give me any sense that those ladies are competing for husband in fact they didn’t have any power too the guy is the one who choose. I’m sorry, but I think that these reality shows don’t deserve the time that I’m spending writing this comment. All of them are rubbish, however many people see them. I don’t know why. It’s sad. At least, if I’m writing this comment, I’m improving my English. hi everybody!… Well, I as well haven’t ever watched anyone those reality shows listed on top; even though I did vote it. So, I also agree with Julio about those shows… they`re more likely to induce ourselves to do something wrong than teach us good things and even less they show us reality good sense. I actually preffer to watch any Globo TV`s soup opera from Brasil than pay attention on those shows. I also have watched the latest Bachelor show once and I felt really really really really really poor feelings about it. I simply hated that guy when he chose one of those finalist girls to be the winner while he`d broken the other one girl`s heart… and few weeks later he turned out to spliting up with the chosen girl and in the meantime calling up for the chance to reconsider the hypothesis to make up with the other fired girl. He simply joked with the girls` feelings. What a shame! but I envy some one that may say just what you have said above……that you have not tv. and survive to that even……that´s really incredible. Congratulations again. Do you live alone? or have some family?. I have to confess that I am very curious about their opinion if you have any family. Now that we are only my wife and me, usually we don’t see tv. either and we use to listen to the radio day after day instead of watchin tv. The big flat tv. we own it is used nearly always to see pictures in dvd as we can´t go to the cinema for the last years due to some illness of her. And of course we love good films, so we see all good cinema we can get on the big flat screen of the tv., that is it’s use at the 90 per cent of time. Relatively,I think all of the four shows are interesting enough to lure some audiance to see. In my country, we havn’t had the show as reality… Imagine that, at first, people are curious about that what other people will do if given such situation. However, as time goes away, people would notice which is not reality at all… they start to critize them…. Well,I think that this is not the greatest topic to talk about but I’d like to say a few things.I agree with what Julio and Emiliano said.The truth is that nowadays I hardly watch tv,mostly because the time I used to spend watching tv in the past, I spend it now doing other things like surfing the net,downloading radio and podcasts like ESLpod,of course,and listening to them on my mp3 player (one of the best gadgets ever invented in my humble opinion)and other more interesting things. And the mass media knew very well that this would happen very soon ,so nowadays is possible to watch tv,listen to the radio and read news on the newspapers websites on the net.And in fact I think that most young people today spend more time watching tv on the net than in a normal television set. But speaking of reality tv,or even better,speaking of tv shows in general,I don’t think that a tv show is good or bad depending on the format(the type of programme),but depending on the way people do it.Let me explain,the only reality tv show I’m looking forward to watch,here in Spain ,is “Operación Triunfo”(kind of “The X Factor” in the US).It’s entertaining,relaxing,with young people working hard and hoping to carve out a niche for themselves in the difficult world of music (kind of Jeff McQuillan with ESLpodcast and the songs he sometimes sings in his podcast), and there’s no abusive swearing either (usually).Well,these are some of the reasons for which I don’t think this is a bad show.But this same show should be considered trash if done in a bad way.And this makes me think of this :the things I consider bad , you may consider them good ,therefore what’s tv trash for me, may be good quality tv for you and vice versa. Thank you Emiliano, I live with my wife and three marvellous cats.I used to watch tv when i was younger(I am 39) then I discovered the radio and i throw the tv away. It was one of the best things I did, now I have plenty of time to do other things such as learning English, so I can listening to ESLpod., reading your comment or a book in English. Thanks Deniele for your reply, yes I may understand that you have plenty of time to do what you like and indeed you and your wife have done a wise decission up to my point of view. any. Sometimes she told me she can say “miau” like another cat……but..
…. so, the esl blog is really good and educative, and indeed it also a such funny and enjoyable place ( I am not sure if there is that word in english “enjoyable”), but it really fits the case here… that comment that emiliano just made right above ….”Sometimes she told me she can say “miau” like another cat……but.”… this was simply hilarious and funny stuff to read, that`s a good prove that jeff isn`t the only one here which got a extra good humor! I have to admit that I have seen many relality shows. But with the years I realize that most of them are trash. I have read in the news about a reality show in UK, in it follows the life someboy’s life with cancer, this person unfortunaly is going to die. But the point is, how far are willing the TV program and the participant? Are we going to see somebody die in live?. We like audience have to made clear what we want on TV. And if we have a TV show with a person giving up to her son or daughter, our responsibility is don’t watch it. This way producers company won’t make that kind of realities. I don’t watch reality shows any more. I used to watch “big brother” or “jungle camp” which is also produced for german TV. But those shows seem to be a “soul striptease”, this is incredible. Since we got private TV in Germany the broadcasts are worse. There is a short story written by a very good science fiction writer that many years ago talk about what is now happening in tv reality shows, here we paste the tittle and the author because it is good and anticipate nearly sixty years ago this reality shows more or less, and it’s possible we are going to this kind of show he told us a long time before when television was begining. Here is the writer and the tittle for everyone who wants to read it. It’s easy to read the story in the web for free. I have seen it just now that I have remember it. When first I read it, I was very young but I can’t forget the story along the years. Bachman that is inspired in the first story of R. Sheckley “The Prize of Peril”. A. Schwarzenegger played the film based on Stephen King Book, as said before, but it was “consi consa”, I prefer of course the two books better. His 1958 short story “The Prize of Peril” was adapted in 1970 as the German TV movie Das Millionenspiel, and again in 1983 as the French movie Le Prix du Danger. Written about a man who goes on a TV show in which he must evade people out to kill him for a week in order to win a large cash prize, it is perhaps the first-ever published work predicting the advent of reality television. In Korea these days there are lots of reality show like them you mentioned. I sometimes used to feel very interesting & touching on this kind of TV show called “unlimited challenge”. Because 5 celebrities on this TV show experienced Bobseigh or as fashion show models. It is difficult for them to do like this because they have not experienced and are extremly busy. But as you mentioned, some of programs are enough to be criticized. They forced TV viewer to smile as they act as dumb. I just wanted to tell you that when in my comment above I said “The X Factor”,I really meant “American Idol”because “The X Factor”has never been aired in the US,although the two shows are very similar.